“Wearing Gloves is So Important in Food Safety” but proper choice and use of gloves is critical in food borne illness prevention. The proper choice and use of gloves. In healthcare, when we replaced latex gloves, we used vinyl gloves. They were seemingly reasonable as a simple protective barrier. But what troubled me the most was the failure rate. The frequent tearing of the glove caused me to double glove when doing higher risk examinations. “vinyl gloves failed 12% to 61% of the time.” That failure rate has led some healthcare investigators to recommend changing this type of glove after 2-3 hours of use. Quite simply vinyl gloves should not be used for food preparation. Nitrile gloves are the optimal choice for food preparers. Not all gloves are equal, and the proper choice of glove really matters. My best advice when choosing gloves for food preparers or food servers is to seek out a glove expert who understands all the issues. Just as the proper choice is important, the proper use really matters in preventing food borne illness. In healthcare, when donning gloves, we protect the glove from touching anything that could be contaminated, and we protect the glove from contamination during use. All techniques are applicable to food safety. Handle the glove and put it on so as not to contaminate the glove. Wash your hands for a minimum of 15 seconds before putting on gloves. Grab the glove by the opening around the wrist. Don’t touch the remainder of the glove. If you do, you contaminate it. 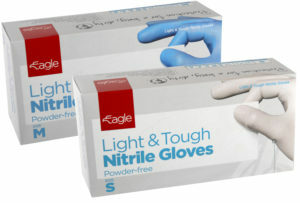 Now you have gloved like a real professional and reduced glove contamination. Don’t contaminate the glove while working. Use of gloves reduces disease spread if you keep them clean. Anything the glove touches could contaminate the glove. The door knob, register, money, or the telephone are not clean. Your hair, your face, your cell phone is not clean. When switching between preparing raw meats and other foods, change gloves. If you contaminate gloves, change them. In health care, we assume anything below the waist is not clean. You should too! Finally, the glove breaks down with use. Leaks can occur, and you might not know it. Gloves should optimally be changed every few hours. Proper gloves cost pennies. Change them often. Change them if in doubt. Prevent cross contamination. If you follow these healthcare proven guidelines, and consider the proper choice and use of gloves while preparing ready to eat food, you become a super star in food safety and will stand out ahead of your peers. But, most importantly you have done your critical part in reducing the misery of food borne illness. That’s a passion we can all aspire to!